OurDomain Amsterdam Southeast, located on a cultural axis in Amsterdam, marks a new impulse. Strategically located next to an academic hospital and train station, the campus with its critical mass of approx. 1.500 apartments and amenities introduces a first residential centre in a predominantly office area. This new campus is the catalyst that ignites the long desired change process from mono-functional office area into a multifunctional city district. The urbanistic objective of the OurDomain campus is to introduce fundamental change, generate new connections and facilitate social space that inspires its users. Inserting three large housing blocks (A, B and C) around an articulated park allows for a recognizable residential atmosphere in a predominant office location. The three blocks, with each independent identity, are designed to be cornerstones that mark the park boundary. Together with the two existing buildings which will be transformed into student housing and medical startups, the campus will become the pivotal centre of the area. The lush, inviting landscape design by karres+brands adds articulated topography to the park. The residual soil of excavating the underground parking garage is used to make small-scale hills that render local quality, give the area a strong identity and inspire people to make use of it. 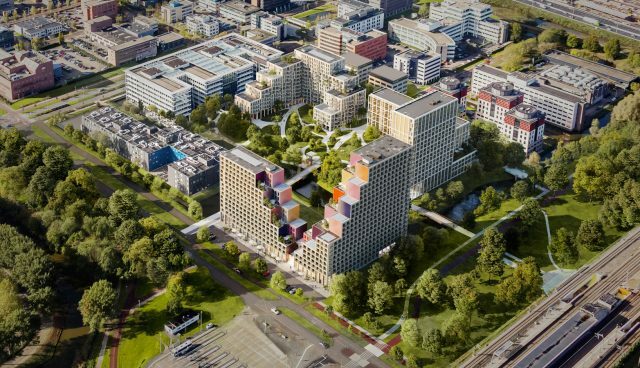 OurDomain Amsterdam Southeast is defined by three large housing blocks (A, B and C) around an articulated park allowing for a recognizable residential atmosphere in a predominant office location. The three blocks, with each independent identity, are designed to be cornerstones that mark the park boundary. In this composition, the campus will become the pivotal centre of the area. With a surface of 40.000 sqm and almost 1.000 student apartments, building A is huge in size. One of the main goals is to give this big building a clear housing expression and human scale, that is to avoid an abstract mass similar to the bigger offices already there. The program for this building, with a large number of small apartments without balconies, has little architectural elements available to give it character. Its cascading facade on two sides, therefore, immediately gives the building its own architectural expression and anchors it in its surrounding. The general idea behind this scheme is not to focus on shaping a 1.000 apartment building but rather the opposite; to carve out parts of the initial envelope given in the urban plan to shape the volume. Block B is designed as a cornerstone with a low wing and a high tower that marks the park entry to the metro station. It has an eloquent build up with a central corridor with the smaller apartments on the North-East façade and the larger apartments with balconies at the South-West façade. On its shackled volumetric design it has a recognizable enveloping grid pattern. This pattern introduces a human scale and is an independent statement of rhythm and measure designed as a concrete grid that envelops a wooden building. This materialization is thought to unite the atmosphere of living and working. A building that is refined and not too delicate. Unlike block A and B, the volume of block C will have to respond to neighbouring existing buildings and make use of the opportunities that this setting offers. The gradual build-up of the block ensures the visibility of the neighbouring buildings from the campus. Additionally, by making a passage at ground level, a physical connection is established. This ensures a direct relation between the existing building and the new landscape. Furthermore, the shared terraces (which belong to the homes) complement the wide range of places that the park already offers and make people part of the public space within the security of their own home.